The modes of business have changed nowadays. Having an online business presence is as important, instead can be said as more important than, as your business’ physical presence. With this thought, many businesses go online making their business’ mobile applications. However, it is difficult to say how effective can this step become for YOUR business as there are several businesses indulged in this market grabbing up a large number of audience. Looking at the trends, people make a Mobile App thinking it would bring millions to them. It could have been the same easy way to achieve as it is to think and plan if we were a decade back from now. Today’s time brings a vast number of mobile application launches to the AppStore and Playstore every day. The success of your business application depends on the number of users holding onto it for a long span of time. According to a Statista report, in the most recently measured period – 2018, 38% of users returned to an application 11 times and more. This report signifies how cruel is the competition getting day by day and it can grow more. With many mobile applications coming in the market with many similar features and functionalities, it is making the users as well go confused which one to download to stay still with. The mobile applications have to play a tug-of-war considering the users as the rope of success; the larger the number of users on your side, the higher the possibility of your app’s success. 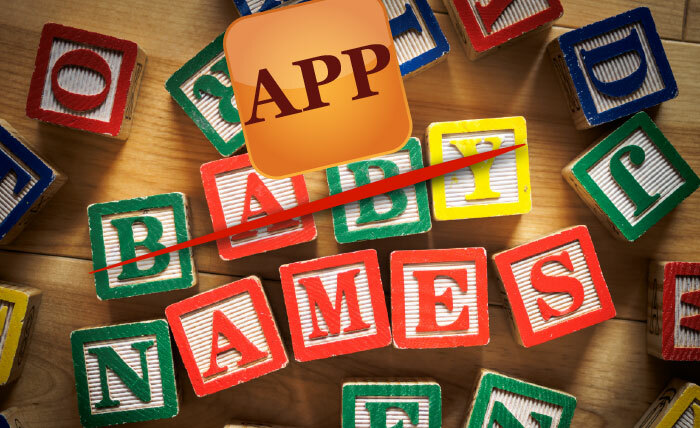 You might be thinking that it is just a name, this is nothing so tough to deal with; but believe me, your application’s name can bring you a significant difference to stand out in the Mobile App’s market. Users will go to your application’s feature much later, but the first thing that draws their eyes towards it is the Name of the Application. The App is going to represent your business online, so it must need to be taken care of very thoughtfully. It must be unique as well as intriguing the users to look deep into the application about the features and make them download it. Should closely relate to the genus of the mobile app’s features. It needs to be different, at the same time, capturing the minds of the viewers. Why should a Logo be considered so important? Well, a logo is the first face of an application. It might be difficult to make a human’s face look beautiful, but it is quite exciting and comparatively stress-free to make an application’s face, Logo, look beautiful. There are the aspects which we must not ignore. We should design the logo as unique as possible, at the same time, keeping it simple. The design should be dominating and amazing and the one that would stick to the viewers’ minds for a long time, possibly lifetime. There are applications in the market that have highly significant logos which have been pasted in our minds since over a decade now. The next thing a viewer would like to check would be the App description on the AppStore or the Playstore. Many applications couldn’t get downloaded because of an insignificant app description. 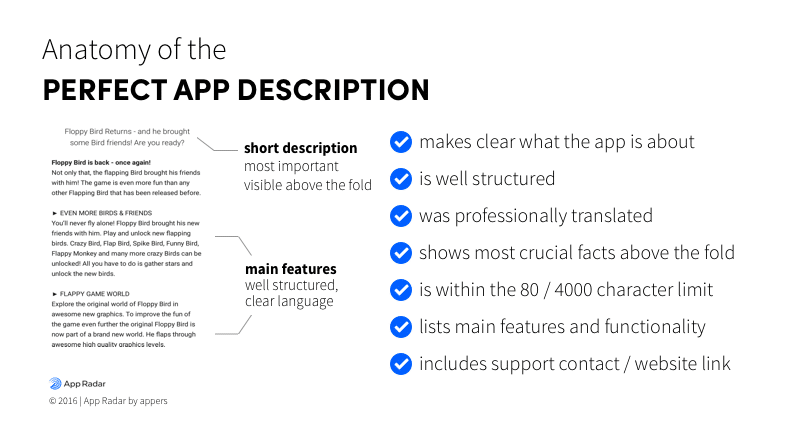 No matter, how smart the application features be, you need an apt app description to move one step ahead. Content is undoubtedly the king. The content used in the app description will be the one that will drive the users to hit on the ‘Download’ button. You need to consider it writing correct matching to the app’s features. It should be smartly written to the point explaining the unique features of the application. The App description was somewhat not much describing the application. The user would like to check the application’s graphical view to understand its features better. Here, we use videos and screenshots of the application’s features to pass the message efficiently. If you hire mobile app developers for your application, you can always ask them to create the pictorial representation of the application for the description purpose. You can ask them to create the videos and take screenshots which explain the application better and are attracting users to download the app. Well, this is the other way users check your application’s fitness for their usability. Well, you might think that this is somewhat not in your control, but it is an important aspect that can bring you the customers. May all the applications have beautifully crafted videos & screenshots and compelling description, but users check the reliability of the app based on the Playstore or AppStore reviews. The number of stars your application gets decides the performance caliber of the application. You can always check the user reviews in the comment section below the app description. 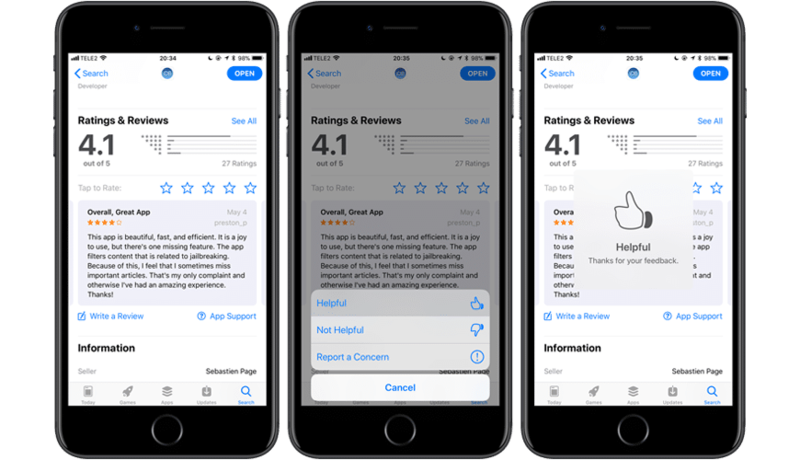 Try to be responsive and active towards the user reviews; sometimes, you can get a higher rating on the AppStore with proper customer service and resolving the queries of the customers. Opt for good mobile application development services which would help you resolve the problems arising to your application. The size of your application can be a critical reason for a customer to press the “Download” button or the “Back” button on the AppStore. If you are working with a Mobile App Development Company for your application’s development, they must keep in mind that they have to squeeze the size of the application to the minimum to cater a large user group. 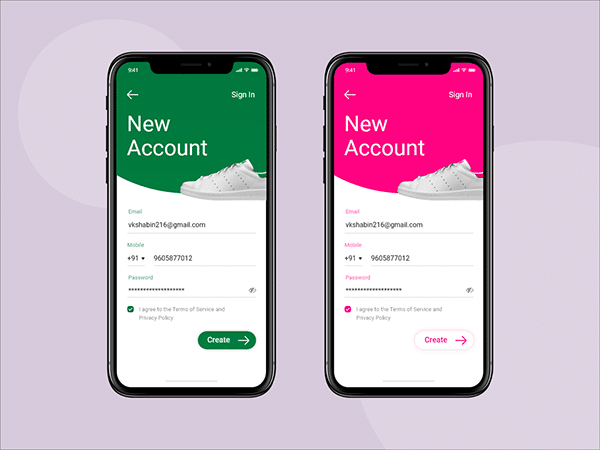 The size of the application matters a lot to a user, it not only makes the download time longer but also affects the storage of the mobile phone; to which the user may not consider downloading the application if it is not much intriguing to the user. Further, if you have built a heavy sized application, the application must be worthy enough of the size and that it should be justifying with its features. In this fast-paced technology world, the updates in the technology are running after every second. A technology which is just a month old is considered to be outdated and needs an updated version to survive in the competition. In such a scenario, it is quite essential for your application as well to stay updated with time to time. An application on the Playstore with the last update date of three months earlier may be considered to have got many glitches, and the old features those need the refresher. Thus, it may decrease the possibilities of getting downloaded. You must hire mobile app developers who are always up to date with technology and are proficient with the mobile application development services they provide to help the business stay updated and get a good number of downloads. People crave for new and unique things for themselves in the market. Be it with the technology or any other product; people expect the best and the unique one for themselves to shine out of the crowd. Your application requires the same. When you have a different set of business features why go with the old, mundane application strategies that had been irritating the customers for days and eventually bringing them down to uninstall the application. Go Ad-free, become more user-friendly, no irritating the users, gain the popularity. If you are considering developing an Android Application for your business, consider hiring a Custom Android App Development service who will help you get an Android application customized perfectly as per your business requirement. We hear they say “The first impression must be the great impression” here and there. In this cut-throat competition, you only get a few minutes to express yourselves. The same goes for your mobile application. A mobile application can get a place in the users’ hearts firstly by its design only. The beautiful the design of App, the more the interest of the user. It is essential for the Mobile App Development Company you have hired to provide you with the best designs for your application. To make your mobile application rock on the market, it must be pleasing the users with the best in the class interface and value delivery to them. Climbed the first ladder, now it’s the time to move on the usability of the application. By now, users have installed your application and loved the interface; it’s the turn of the User Experience now. There are several aspects to consider with the user experience to make it more popular among the users. When hiring one from some of the top 10 Mobile Application Development Companies, you must be ensuring that how proficient are they towards the User Experience development. The application should be quick with the operations. It must not be too loaded. No bugs should reside in the app functionalities. Moving from one feature to another should not take many steps. The feature and menu options should be simple and guiding the user to the desired action. While missing on the user experience can make you lose on the customers. A good businessperson would always be eager and love to hear from the customers. A customers feedback is a valuable piece of information which you can’t get by yourself. Always, appreciate the customer feedback and encourage them to share their reviews. 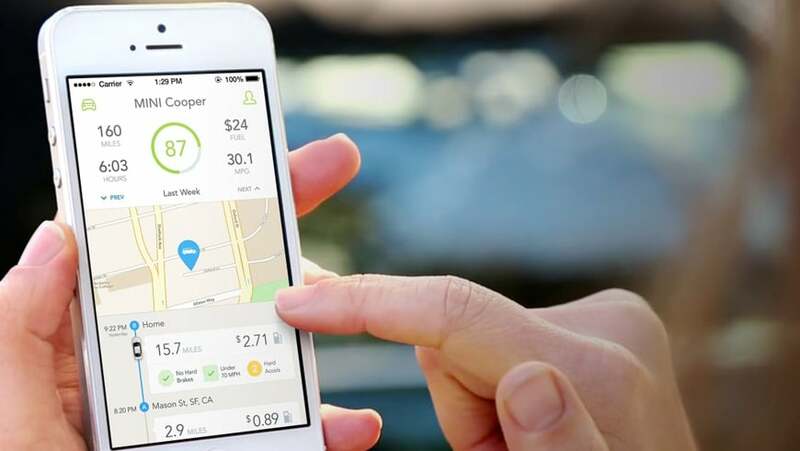 This way, you will come to know about the present working of your application and become able to find the scope of improvements or betterment in the App. Take the effort of reading through all the reviews of the customers, as it is quite a genuine act to write a review to help the developer; otherwise, they can quickly move to a different App with similar features. Your application has been downloaded but hasn’t been used now for a week or even more? That’s a sad part as well as an Alarm to which you should wake up. Always keep an observing eye, if your user is using the application daily. The user must use the app at least once in two days, if not daily. If not used regularly, this may make the customer forget about your application and eventually end up getting uninstalled from the phone. Do make sure you engage with your customers, reminding them with some offers in the application or any updates you have upgraded in the app. Considering these points, some trained Android App Development Services or some top iPhone app developers can make their mark by providing the exceptional mobile application development services in the market. Businesses want to have the mobile applications developed which amplify their business growth and bring many new customers and opportunities to them. In that order, it is pretty necessary that you chose one of the Top Mobile App Development Companies in India or the USA who can let Hire Dedicated Android App Developer or iOS developer for your business mobile application. Well, we have been making a hell lot of efforts to build a unique business and cater to most of the crowd out there. However, we are not alone in this trail. There are competitors who either follow the same idea with minute modifications or strive to create something more unique and better considering the current one. In any scenario, you always need to be on the heels to be on the top of our game. Here, you are not alone to realize this dream of yours to have a user-friendly and user-gathering mobile application. 21twelve Interactive, the mobile app development company in India, is always up with its developers to provide you with all the mobile application development services of which your business deserves to have the best.